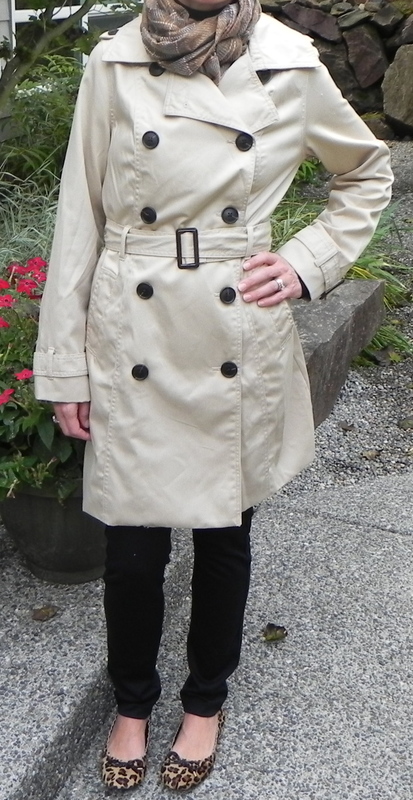 A fitted trench coat is always stylish, and warm! Yesterday was soccer, today lacrosse! These kids and their sports, gotta love it! I remember last year being at one of my son’s lacrosse games and seeing this cute mom from across the field. She had on a trench coat, skinny pants and flats- while I had one something similar to my post from yesterday (not the North Face). I decided then and there that I needed to make some changes. I am totally copying her look- but isn’t what this blog is about? Finding inspiration and style from other moms? I found this cute trench at Target and think it is a perfect coat- it has a nice length (covers my behind), has a belt which gives it shape and will keep me warm. Tim Gunn says that a trench is one of the must have items for every women’s wardrobe. I’m a big Tim Gunn fan! Underneath I am wearing black skinny stretch pants (see similar Sanctuary brand) that I got at Marshalls (love a good deal). These are the MOST comfortable pants ever. To add a little spice to my look, I threw on my leopard flats (again, great deal from Target) and a cute fall scarf (also from Target). I’m dressed on a dime today! Luckily you don't have to spend a fortune to own a trench, this was $50! Thanks so much for commenting! I love hearing from readers!